L-R, James Long-Goth, Leonard Mukai, Amy Kessinger-Okuyama. Day at the Park, a family fun and educational event sponsored by Thy Word Ministry, March 10, 2010. 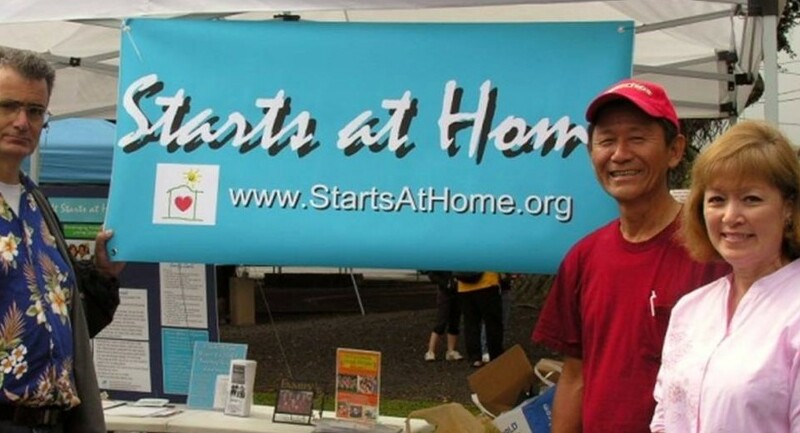 An affiliate of Starts at Home Leonard Mukai, Ph.D, has an excellent online program called No Parenting Problems. 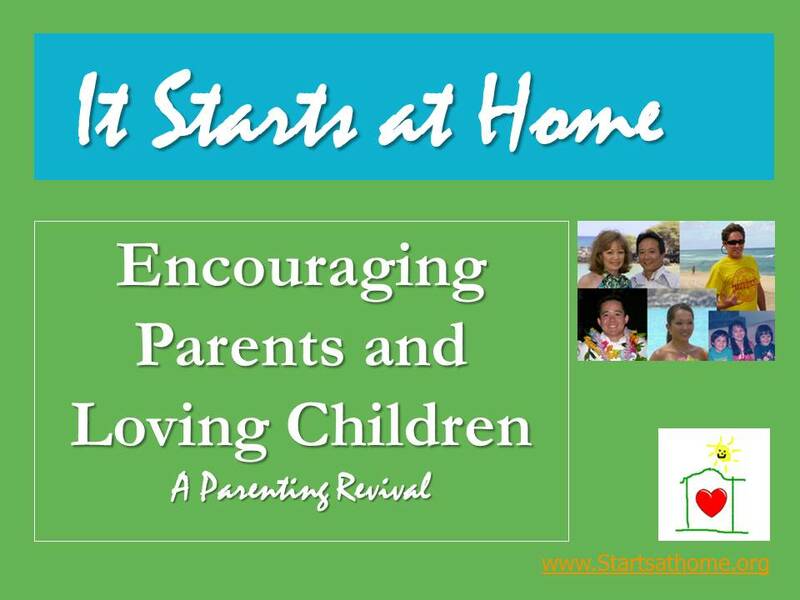 He and his wife Cecilia Mukai, Ph.D are giving this 30 day video presentation FREE to encourage and help parents; he believes parenting “Starts at Home” and is sharing his program. Speaking to Leonard, his most distant viewer comes from Russia who found his lessons simple and effective. Each video is about one minute. Here’s a link to one (1) of thirty (30) FREE videos. You know how difficult it is to teach a child and sometimes when we say “no”, all hell breaks loose …. the crying, the pouting, the tantrum and tirades. This video teaches us one way how to say “No” the right way. It’s a pretty simple and cool technique; enjoy this one minute video. To get started on this FREE program visit http://www.noparentingproblems.com; the concepts shared are ageless wisdom. Enjoy your children and family; encouraging parents and loving children starts at home. March 3rd is Girl’s Day a great day to spend time with the little angels in our lives. A trip to the beach, a special dessert, or a gift, and the most important gift.. a gift of time and your love. Have fun and enjoy your children, they grow up so fast. Thank You grandpa and grandma for your helping in raising our family. September 8th is National Grandparent’s Day. Happy Grandparent’s Day to all the grandparents, have and wonderful day and give your grandchildren a big hug! If that’s not possible call them over the phone and give them phone hugs or hopefully they’ll call you. Here’s a nice story. Grandma May shared a wonderful moment with her granddaughter April, a toddler who recently became three years old. One morning just before 7:30 am, April called grandma’s cell phone. Grandma recognized her son’s phone via Caller ID, answered it and heard the voice of her granddaughter April, who asked “where are you?” Grandma replied “at work” and April replied “bye!” which ended the call. What a short and sweet call to get from your grandchild! It’s so joyful to know that your toddler grandchild misses you and goes out of her way to phone you. April abruptly ended her call because she knows grandma cannot talk to her while working, a lesson and rule taught to her from grandma and her parents. It’s pleasing to hear how toddlers learn to obey their parents, an important rule that will help them through early childhood development. At two to three years of age, toddlers begin to learn at genius speeds. This is their “Planting Twos” years, and all they need is the sharing, teaching and loving discipline of their parents and loved ones. May and her parents Mark and Olivia, nice, “pat on the back” and way to go! On the way to the airport at IHOP restaurant, Andee is sad because Grandma is leaving today. “stay ganma” she said. Then when asked if she wanted to go home with grandma, replied, “otay” Parenting joys from spending time with them are precious. Being excited watching grandchildren growing up is one the joys in life. It’s wonderful to have grandchildren at the age where they can recognize people and appreciate the attention, love, and teaching associated with the nurturing and bonding that was given during the first years of infancy; at age two it’s a transitional year when they go from an infant to a toddler, it’s the “planting twos” where children learn at genius speeds. This week Amy was in Honolulu helping our daughter Kimberly and her husband, Christian. 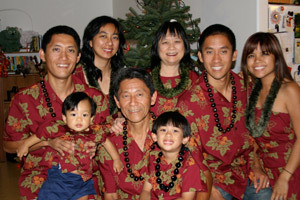 Amy was glad to help and flew to Honolulu to be with their family. Amy was anxious to see our granddaughter Andee and have fun with her. The week was busy as usual with Amy training and playing with Andee, including reading, writing and coloring, chasing her around the house, blowing bubbles, going to tumbling class, “putting make-up” on grandma, and cooking with the family; it was a busy and fun week. After a week with Andee, Amy sees that Andee is happy and learning quickly, using sentences, and having less tantrums. This is because Andee’s “planting twos” years is being nurtured by her parents and family’s constant interaction, play, and loving discipline. 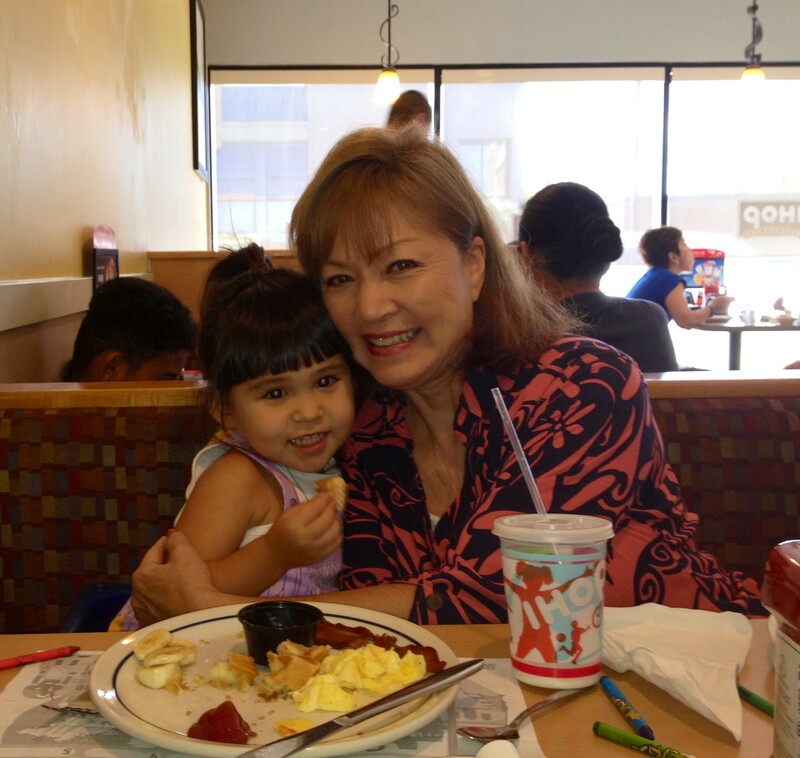 While having breakfast Kimberly told Andee, grandma was going back home to Hilo today, Andee’s response put a tear in grandma’s eyes, Andee with a really sad face said, “Gamma stay”. And, when Kimberly asked Andee if she wanted to go with grandma, she said “otay”. Joy from parenting doesn’t come from living in a big house nor the things we buy for them, seeds of joy comes from quality time we spend with children. Today, give the children a hug and lots of quality time together, the rewards are eternal. 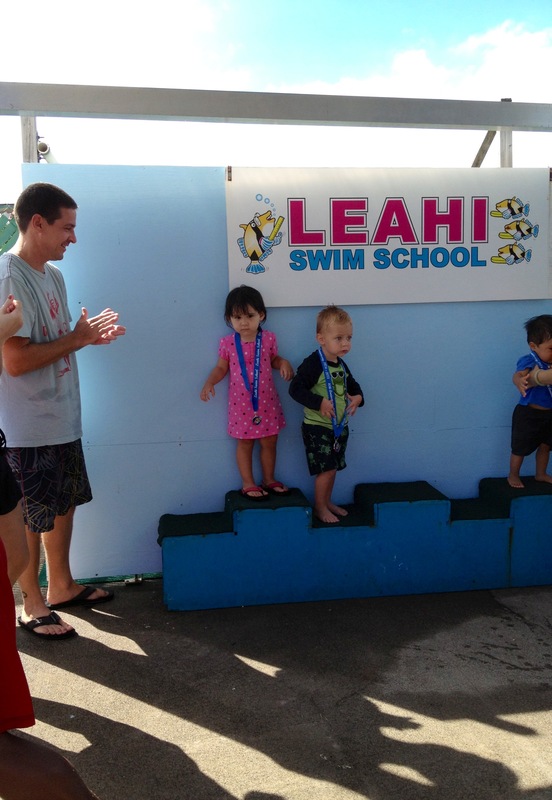 Dad Christian applauds Andee’s finishing swimming lessons over the summer.